A wide variety of immunologic, idiopathic, neoplastic, infectious, and fungal processes can cause a chronic granulomatous reaction in the head and the neck (see the images below). A granuloma is a focal area of chronic inflammation produced by circulating monocytes as part of an immunologic process. A granulomatous reaction is characterized histologically by transformed macrophages (epithelioid cells) surrounded by lymphocytes. These epithelioid cells may later fuse to form giant cells. Mass on the right side of the neck in a patient with histiocytosis X. Mass on the right side of the neck in a patient with atypical tuberculosis. Granulomatous diseases cause a great range of symptoms not only in the head and neck but also throughout the body. Because patients initially present to the otolaryngologist's office, a full history and a complete physical examination are emphasized for all patients. Although similar histologically, granulomatous diseases of the head and the neck require a thorough approach because of the wide variety of disease processes. Granulomatosis with polyangiitis most commonly occurs in whites during the third to fifth decades of life. Often, the patient initially presents with symptoms that involve the head and neck. Inflamed, friable mucosa; ulcerations; septal perforations; and saddle nose deformities may be seen on nasal examination; therefore, the patient may present with various nasal symptoms, including chronic nasal congestion, epistaxis, and pain. The patient may also present with laryngeal symptoms (wheezing), ear symptoms (otitis media), and oral ulcerations. Pulmonary symptoms include cough and hemoptysis. A mismatch often occurs in the severity of the symptoms and the relatively benign appearance of the lesions. Laboratory evaluation includes elevated inflammatory indicators, such as C-reactive protein and erythrocyte sedimentation rate (ESR). An elevated classic antineutrophil cytoplasmic antibody (C-ANCA) level is 80% specific for granulomatosis with polyangiitis. In disseminated disease, 78-100% sensitivity is reported, whereas in upper airway disease, 60-70% sensitivity is reported. Histologic examination reveals granulomatous change consisting of macrophages and accompanying inflammatory cells and giant cells. A characteristic patchy necrosis surrounded by giant cells through the tissue is often present. The vasculitis reveals granulomatous inflammation to the vessel wall in small and medium-sized arteries and veins, making granulomatosis with polyangiitis a true vasculitis. Other features that may be noted on histopathologic examination include microabscess formation and cicatricial scarring. Treatment includes steroids for 4-6 weeks until the disease is controlled. Steroids are then tapered over 6 months. Cyclophosphamide is an alkylating chemotherapeutic agent that can be tapered to a maintenance dose. Trimethoprim-sulfamethoxazole has also demonstrated early promise. Repeated inflammatory insult in granulomatosis with polyangiitis leads to focal areas of scarring and fibrotic damage to airway structures. Only 20% of cases of subglottic stenosis due to the disease will resolve with immunotherapy. Therefore, laser treatment, tracheal resection and anastomosis, and tracheotomy are treatment options for subglottic stenosis secondary to granulomatosis with polyangiitis. The prognosis is good if the disease is treated early and prior to significant renal involvement. Relapsing polychondritis is a rare autoimmune disorder that affects cartilage and tissue containing glycosaminoglycans. It often presents with other autoimmune disorders. Typical manifestations include nasal chondritis (15%), auricle chondritis (50%), nonerosive polyarthritis (50%), respiratory tract chondritis (15%), and ocular inflammation (15%). This recurrent chondritis presents with sudden, painful episodes that resolve in 7 days. The sequelae include saddle nose deformity, auricular deformity, airway compromise, and visual disturbance. Although gross findings are nonspecific, relapsing polychondritis is characterized by an overall thickening of the cartilage in the head and the neck, including the ear, the nose, the epiglottis, and the cricoid and tracheal rings. The perichondrium is infiltrated by a spectrum of inflammatory cells, leading to its destruction. Laboratory evaluation reveals an elevated erythrocyte sedimentation rate (ESR) level during disease activity. The most specific test available looks at antibodies to collagen type II, which is exclusively found in cartilage. Treatment includes immunosuppressive agents. Steroids are most commonly used. Discoid lupus erythematosus is the least aggressive form and affects only superficial tissues. Patients with discoid lupus erythematosus may present with oral or cutaneous lesions consisting of elevated erythematous plaques, hypopigmented edges, and alopecia. Scarring from these lesions may be the only sequela. Diagnosis is based on clinical examination because the findings from the antinuclear antibody (ANA) test and the lupus erythematosus (LE) cell test are negative. Subacute cutaneous lupus presents with papulosquamous lesions that do not scar. Mild systemic involvement may occur. The findings from the ANA test and the Sjögren syndrome A antibody (SS-A [anti-Ro]) and Sjögren syndrome B antibody (SS-B [anti-La]) tests are inconsistent and cannot be used to aid in making a diagnosis. The ANA test is 98% specific for systemic lupus erythematosus, and the findings from the LE cell test and the SS-A (anti-Ro) and SS-B (anti-La) tests are typically positive. A nonspecific test, such as the ANA test, the SS-A (anti-Ro) test, or the SS-B (anti-La) test, is initially used to aid in establishing a diagnosis. Specific markers include anti–double-stranded (DS) DNA and Sm antigen (SmAg). Treatment typically includes nonsteroidal anti-inflammatory drugs and steroids. Churg-Strauss syndrome is characterized by the triad of asthma, systemic vasculitis, and eosinophilia (peripherally and within the tissue). Patients with Churg-Strauss syndrome may present with nasal symptoms similar to those of granulomatosis with polyangiitis. (A study by Fina et al of 14 children with Churg-Strauss syndrome found that 85% had upper airway involvement.  ) Histologic examination reveals granulomatous changes to the tissue, and true vasculitis and eosinophilia are present. The disease predominates in females, with a peak incidence in the third to fifth decades of life. Sarcoidosis is 10-20 times more common in blacks in North America, whereas blacks on other continents are spared. The disorder most commonly presents with hilar adenopathy detected on an incidental chest radiograph. Almost 90% of patients with sarcoidosis have pulmonary involvement that can cause cough, hilar adenopathy, and dyspnea. In the larynx, sarcoidosis typically presents as a submucosal mass in the supraglottis, most commonly in the epiglottis. True vocal fold paralysis has been reported. Nasal examination may reveal cobblestoning of sinonasal mucosa, crusting, and epistaxis. Stage II - Moderate disease involvement or limited single sinus involvement. Braun and associates found that the most common presentation was of chronic, nondestructive, crusty, inflammatory nodules on the septum and turbinates. Functional endoscopic sinus surgery (FESS) can improve a patient's quality of life, but recurrence is likely. 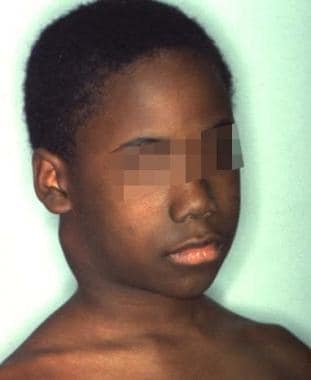 Sarcoidosis may affect the salivary glands, and its presentation may range from an asymptomatic parotid mass to Heerfordt disease, an extrapulmonary sarcoid manifestation of uveitis, facial palsy, sensorineural hearing loss, fever, and parotid enlargement. The disease may cause a progressive interstitial lung disease, and blindness may result from the progression of uveitis. Other cutaneous findings include erythema nodosum and Darier-Roussy nodule (subcutaneous nodules). Cardiac arrhythmias, neuropathies, and hepatic and renal involvement may also be present. Establishing a diagnosis is complex, and evidence can consist of findings on laboratory studies, biopsy specimens, and radiologic studies. The Kveim-Siltzbach skin test involves an intradermal injection of an antigen extract from a patient who is known to have this disease. If the patient develops a nodule within 4-8 weeks and if histopathologic examination reveals noncaseating granulomas, the likelihood of disease is 80%. Elevated angiotensin-converting enzyme (ACE) levels and urine/serum calcium levels may also suggest sarcoidosis. Histologic examination reveals a granulomatous disease consisting of discrete, noncaseating epithelioid granulomas; an accumulation of T cells; mononuclear macrophages; and giant cells. 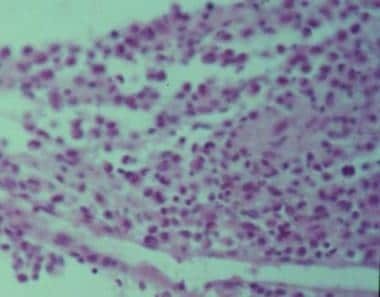 The giant cells associated with sarcoidosis are usually larger than those associated with tuberculosis, and intracytoplasmic inclusion bodies may be present. Treatment includes steroids for exacerbations of the pulmonary disease. Isolated sinus lesions may be treated with topical and injectable steroids. Some authors have reported good success with endoscopic sinus surgery. Supraglottic lesions are usually monitored clinically, with surgery reserved for obstructing lesions. As its name implies, idiopathic midline destructive disease (IMDD) is a midline destructive disease. The disease is localized to the head and the neck, and it may present with pansinusitis and ulceration of the nasal floor and septal ulcerations. Biopsy specimens reveal sheets of typical polymorphonuclear cells without granulomas or vasculitis. Studies from Asian and Western countries have shown a possible association with Epstein-Barr virus. The lack of granulomatous change on histologic examination makes the classification of IMDD as a granulomatous disease controversial. Treatment consists of radiation therapy for local disease; cyclophosphamide and prednisone are administered for multiregional disease. Eosinophilic granuloma is the localized form of histiocytosis X occurring in children and young adults. The disease may be monostotic or polyostotic, typically affecting the temporal bones and the frontal bones. The presentation may vary and includes acute mastoiditis, middle ear granulation tissue, tympanic membrane perforations, proptosis, and facial nerve paralysis. The histologic characteristics of eosinophilic granuloma are demonstrated in the image below. Treatment is typically surgical curettage, with radiation therapy reserved for inaccessible lesions. The prognosis is excellent for patients with eosinophilic granuloma. This chronic, disseminated form of histocytosis X also occurs in children and young adults. The disease is polyostotic and classically consists of skull lesions, exophthalmos, and diabetes insipidus. Diabetes insipidus results from erosion into the sella turcica. Treatment of Hand-Schüller-Christian disease typically includes surgical excision, chemotherapy, and radiation therapy. Otitis externa in this disorder may be treated with topical nitrogen mustard. The mortality rate for the Hand-Schüller-Christian disease is approximately 30%. This disease, an acute, disseminated form of histocytosis X, typically affects infants and young children. Patients with Letterer-Siwe may present with fever, proptosis, splenomegaly, hepatomegaly, or dermatitis. Treatment is a combination of radiation and chemotherapy. This disorder is uniformly fatal. Fibrous histiocytoma presents with nasal obstruction, epistaxis, dysphagia, and dyspnea. It can occur at any age and is found mostly in males. Lobular capillary hemangioma, also known as pyogenic granuloma, usually presents as a painless, friable lesion anywhere on the head and neck. It develops in prepubescent males, in postpubescent females, or during pregnancy. It is believed to be hormonally responsive. Treatment is surgical excision. Catscratch disease (CSD) is caused by Bartonella henselae, an intracellular, pleomorphic, gram-negative bacteria. A high percentage of cats carry B henselae. Patients with CSD typically present with tender regional adenopathy and provide a history of a cat scratch or bite; 50% of patients have a vesicle or a pustule within a week after the cat scratch. Painful lymphadenopathy develops near the primary lesion a few weeks after inoculation. Head and neck lymphadenopathy occurs in about one half of all patients with CSD. Treatment includes erythromycin, rifampin, or doxycycline. CSD is fatal if left untreated in patients who are immunocompromised. Second stage - The florid, or granulomatous, stage, consists of granulomatous nodules on the head and the neck, especially the glottis and the subglottis. Clinical diagnosis is based on the classic honeycomb crusting seen in the nose. Biopsy specimens may reveal pseudoepitheliomatous hyperplasia, Russell bodies, and Mikulicz cells. Russell bodies are bifringent inclusions and bloated plasma cells. Mikulicz cells are multinucleated macrophages that contain the bacteria and are most abundant during the florid phase. Treatment consists of long-term therapy with either streptomycin or tetracycline. If the cicatricial stage causes stenosis, dilatation may be necessary. Leprosy is caused by exposure to Mycobacterium leprae. Patients may present with hypopigmented macules, tuberculoid skin, mucosal nodules in the mouth and the nose that subsequently ulcerate, laryngeal ulcerations, lymphadenopathy, nasal collapse, and fish-mouth deformity. Treatment consists of dapsone. The main organisms responsible for granulomatous change in the head and the neck are Mycobacterium avium-intracellulare complex, M scrofulaceum, M kansasii, M fortuitum, and M bohemicum. Persistent lymphadenitis is the most common cause of nontuberculous infection in children. The route of transmission is from environmental sources (eg, soil in the mouth or the eye). Head and neck manifestations include corneal ulcerations, cervical lymphadenopathy, and, rarely, mastoiditis. The typical presentation of nontuberculous mycobacteria adenitis is of a slowly enlarging submandibular or preauricular mass in the absence of systemic signs of infection. The mass is typically nontender and does not respond to standard antibiotics. The mass may progress to discoloration and spontaneous drainage through the skin. Several tests are performed to aid in establishing a diagnosis. Computed tomography (CT) scanning with contrast demonstrates asymmetrical cervical lymphadenopathy, and contiguous, low-density, necrotic, ring-enhancing masses involving subcutaneous fat are typically minimal or absent in nontuberculous mycobacteria adenitis. A significant amount of inflammatory stranding in the subcutaneous fat is not usually seen as in bacterial abscesses. Diagnosis is by culture and sensitivity, which may take as long as 4 weeks and is reported in approximately 60% of patients. The purified protein derivative (PPD) test is either only mildly reactive or absent. Stains for acid-fast mycobacteria are positive in only 20-50% of patients. A diagnosis may be made empirically based on the pathologic diagnosis, the history, and physical examination findings suggestive of nontuberculous mycobacteria infection. Treatment involves lymph node excision because incision and drainage may lead to either recurrence or sinus tract formation. In addition to physician experience, antibiotics are chosen by epidemiology and minimum inhibitory concentration (MIC). Tuberculosis, a result of inhalation of M tuberculosis into the lungs, rarely affects the head and neck. Primary infection is typically an asymptomatic lower lobe lesion, and a calcified lung lesion and a draining lymph node are often present, thus forming a Ghon complex. Secondary involvement manifests with night sweats, fever, weight loss, and chronic, nonproductive cough. It also affects apical segments. The most common manifestation on the head and the neck is cervical lymphadenopathy, presenting as firm and nontender. Tuberculosis appears as nonspecific, homogenous enhancement on CT scan. When present in the larynx, tuberculosis typically involves the posterior glottis, with granulation tissue and ulcerations. Otologically, tuberculosis manifests as a painless, odorless, watery otorrhea with multiple miniature tympanic membrane perforations. Diagnosis is aided by a PPD test and a chest radiograph. Sputum cultures and biopsy samples may also be obtained. The causative organism of syphilis is Treponema pallidum. Syphilis may present as early stage or late stage. The primary stage presents as a chancre at the inoculation site. The second stage is highly contagious and presents with general malaise, fever, and mucous patches. The disease remains latent in about one third of patients; one third of patients go into remission; and the final one third of patients have tertiary syphilis, which may occur years after the initial infection with a slowly progressive disease and may involve the central nervous system (neurosyphillis), the aorta, and gummas. Patients can present with various symptoms involving the head and the neck and may have generalized lymphadenopathy. Syphilis may cause laryngitis, vocal fold paralysis, or dysphagia. It may also cause granulomatous involvement of the oral and nasal mucosa, septal perforation, and a chancre in the oral mucosa. Otologically, syphilis presents as an abrupt, fluctuating sensorineural hearing loss. Gummas may also be found in the temporal bone. Diagnosis is aided by performing the specific fluorescent treponemal antibody absorption (FTA-ABS) test. Treatment consists of penicillin, with steroids reserved for otologic involvement. For patient education information, see the Sexual Health Center, as well as Syphilis. The fungus Histoplasma capsulatum causes histoplasmosis. It most commonly occurs in the Ohio and Mississippi River Valleys. The organism is spread by airborne transmission of avian droppings. Persons who are immunocompromised may present with painful ulcers on the lips, the gingiva, the tongue, the pharynx, or the larynx. Culture on Sabouraud medium, skin test, complement fixation, or latex agglutination can be used to establish a diagnosis. Patients are treated with amphotericin B.
Blastomycosis is caused by Blastomyces dermatitidis. The common triad consists of cutaneous disease, pulmonary involvement, and constitutional symptoms. Individuals with blastomycosis often have either an immunodepressive condition or diabetes mellitus. Establishing a diagnosis can be difficult. Blastomycosis is often mistaken for pneumonia sensu latu, malignant tumors, and tuberculosis. To confirm the diagnosis, sputum culture on Sabouraud medium is performed. New serologic tests include the sandwich enzyme immunoassay (sensitivity 88%, specificity 100%) and a 120kd antigen radioimmunoassay (sensitivity 85%, specificity 100%). Histopathologic examination reveals a pseudoepitheliomatous hyperplasia and a single bifringent, broad-based bud. Rhinosporidiosis is caused by the sporangium Rhinosporidium seeberi, which is primarily found in southern India. This lesion is spread by contaminated water. The physical examination may reveal strawberry lesions, which are painless, warty lesions found on the mucous membranes of the head and the neck, particularly in the nasal mucosa. Treatment consists of surgical excision and oral antifungal agents. Granulomatous diseases also occur due to hereditary defects in immunity. Patients with these diseases present with recurrent or chronic infections. Typically, defects in neutrophils and monocytes are the etiology of recurrent infections, but other deficiencies may contribute. Chronic granulomatous disease is a rare disorder of phagocytic cells. It is a congenital disorder (66% X linked, 33% autosomal recessive) that results in a defect in the mechanism for intracellular killing of bacteria by neutrophils and macrophages. This translates clinically into patients with recurrent infections from catalase-positive organisms (ie, Staphylococcus aureus), gram-negative bacteria, and fungi. This will result in eczema, osteomyelitis, abscesses, and granulomas. The treatment is frequent courses of antibiotics and surgical debridement of infections. Treatment can also consist of interferon gamma, granulocyte colony-stimulating factor (G-CSF), and granulocyte-macrophage colony-stimulating factor (GM-CSF) to stimulate neutrophils. Chediak-Higashi syndrome is an autosomal recessive disorder that presents with oculocutaneous albinism, neuropathy, neutropenia, and possibly malignancy. Job syndrome is an extremely rare disorder caused by extremely elevated levels of IgE and eosinophils. Patients often first present with eczema and characteristic staphylococcal abscesses. Prophylactic antistaphylococcal antibiotics are often used but have not been proven to be effective. Greco A, Marinelli C, Fusconi M, et al. Clinic manifestations in granulomatosis with polyangiitis. Int J Immunopathol Pharmacol. 2015 Dec 18. [Medline]. Abdou NI, Kullman GJ, Hoffman GS, et al. Wegener's granulomatosis: survey of 701 patients in North America. Changes in outcome in the 1990s. J Rheumatol. 2002 Feb. 29(2):309-16. [Medline]. de Groot K, Reinhold-Keller E, Tatsis E, et al. Therapy for the maintenance of remission in sixty-five patients with generalized Wegener's granulomatosis. Methotrexate versus trimethoprim/sulfamethoxazole. Arthritis Rheum. 1996 Dec. 39(12):2052-61. [Medline]. Lynch JP 3rd, Hoffman GS. Wegener's granulomatosis: controversies and current concepts. Compr Ther. 1998 Sep. 24(9):421-40. [Medline]. O'Devaney K, Ferlito A, Hunter BC, Devaney SL, Rinaldo A. Wegener's granulomatosis of the head and neck. Ann Otol Rhinol Laryngol. 1998 May. 107(5 Pt 1):439-45. [Medline]. Puechal X, Pagnoux C, Perrodeau E, et al. Long-Term Outcomes Among Participants in the WEGENT Trial of Remission-Maintenance Therapy for Granulomatosis With Polyangiitis (Wegener's) or Microscopic Polyangiitis. Arthritis Rheumatol. 2016 Mar. 68 (3):690-701. [Medline]. Springer J, Nutter B, Langford CA, et al. Granulomatosis with polyangiitis (Wegener's): impact of maintenance therapy duration. Medicine (Baltimore). 2014 Mar. 93(2):82-90. [Medline]. Saccucci M, Di Carlo G, Bossu M, Giovarruscio F, Salucci A, Polimeni A. Autoimmune Diseases and Their Manifestations on Oral Cavity: Diagnosis and Clinical Management. J Immunol Res. 2018. 2018:6061825. [Medline]. [Full Text]. Adil A, Quint JM. Behcet Disease. 2018 Jan. [Medline]. [Full Text]. Gueudry J, Wechsler B, Terrada C, et al. Long-term efficacy and safety of low-dose interferon alpha2a therapy in severe uveitis associated with Behçet disease. Am J Ophthalmol. 2008 Dec. 146(6):837-44.e1. [Medline]. Cinar S, Cinar F, Kiran S. Is there a need for audiologic evaluation in patients with Behçet disease?. Ear Nose Throat J. 2012 Mar. 91(3):E15-9. [Medline]. Fina A, Dubus JC, Tran A, et al. Eosinophilic granulomatosis with polyangiitis in children: data from the French RespiRare® cohort. Pediatr Pulmonol. 2018 Jun 26. [Medline]. Braun JJ, Gentine A, Pauli G. Sinonasal sarcoidosis: review and report of fifteen cases. Laryngoscope. 2004 Nov. 114(11):1960-3. [Medline]. Kay DJ, Har-El G. The role of endoscopic sinus surgery in chronic sinonasal sarcoidosis. Am J Rhinol. 2001 Jul-Aug. 15(4):249-54. [Medline]. Gulati S, Krossnes B, Olofsson J, Danielsen A. Sinonasal involvement in sarcoidosis: a report of seven cases and review of literature. Eur Arch Otorhinolaryngol. 2012 Mar. 269(3):891-6. [Medline]. Kessler P, Wiltfang J, Schultze-Mosgau S, Neukam FW. Langerhans cell granulomatosis: a case report of polyostotic manifestation in the jaw. Int J Oral Maxillofac Surg. 2001 Aug. 30(4):359-61. [Medline]. Habot-Wilner Z, Trivizki O, Goldstein M, et al. Cat-scratch disease: ocular manifestations and treatment outcome. Acta Ophthalmol. 2018 Mar 5. [Medline]. Hansmann Y, DeMartino S, Piemont Y, et al. Diagnosis of cat scratch disease with detection of Bartonella henselae by PCR: a study of patients with lymph node enlargement. J Clin Microbiol. 2005 Aug. 43(8):3800-6. [Medline]. Hoey JG, Valois-Cruz F, Goldenberg H, et al. Development of an immunoglobulin M capture-based enzyme-linked immunosorbent assay for diagnosis of acute infections with Bartonella henselae. Clin Vaccine Immunol. 2009 Feb. 16(2):282-4. [Medline]. Thompson LD. Rhinoscleroma. Ear Nose Throat J. 2002 Aug. 81(8):506. [Medline]. Volante M, Contucci AM, Fantoni M, Ricci R, Galli J. Cervicofacial actinomycosis: still a difficult differential diagnosis. Acta Otorhinolaryngol Ital. 2005 Apr. 25(2):116-9. [Medline]. Sharma S, Valentino III DJ. Actinomycosis. 2018 Jan. [Medline]. [Full Text].